The 35mm autocannon is a Jiralhanae weapon mounted on the Type-25 Chopper, which originally used Type-25 Spikers mounted on the sides when the vehicle was first designed. The 35mm autocannons are the primary offensive asset of Jiralhanae Type-25 Choppers, and each Chopper is mounted with four linked forward-firing 35mm autocannons. This cannon is surprisingly powerful, and its ammunition is probably a smaller form of the Type-25 Brute Shot round, fired at a slower rate. 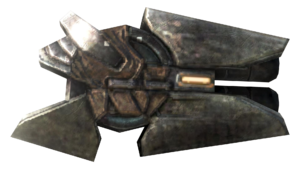 The term "autocannon" is not entirely accurate when referring to the weapon due to its alien design. However, it is self-loading and fires explosive projectiles larger than 20mm much like its human-made counterparts. The 35mm autocannon uses a very powerful shell, but has a very low rate of fire. The rounds are too slow to take down fast targets, and so it is most effective to lead targets. Use this gun on short-medium range. Drive forward or stop momentarily, because the guns are forward mounted on a mobile section of the Chopper. Do not attempt to use this gun against multiple targets simultaneously. Repeatedly tap the fire button instead of holding it down. This will increase the rate of fire. Prepare an anti vehicle weapon, as the driver may attempt to splatter you. The 35mm autocannon can only shoot down one enemy at a time, so don't rush among enemy formations, and don't stay there for too long, for this greatly increases the chances of you being killed. Avoid excessive turning while firing as this will throw off the rounds' trajectory. Do not use it against aircraft. The autocannons do produce some kickback, so when you are trying to pull off some move that requires lots of mobility you are advised to stop firing. Detail of the 35mm Autocannon on a Brute Chopper. ↑ 1.0 1.1 Bungie.net: TYPE-25 Rapid Assault Vehicle "Chopper"